Størrelse på denne forhåndsvisningen: 578 × 600 piksler. Andre oppløsninger: 231 × 240 piksler | 463 × 480 piksler | 769 × 798 piksler. English: Satellite map of the San Francisco Bay Area of Northern California - from the U.S. Geological Survey. The effect of the San Andreas Fault on the terrain can been seen on a diagonal line from the upper left corner to the lower right. The green and golden mountainous regions (wrinkled in appearance) are largely uninhabited. The Golden Gate is the narrow connection between the San Francisco Bay (east and south of the entrance) and the Pacific Ocean (left). The northern part of the inland water is the San Pablo Bay, fed by Suisun Bay and the San Joaquin-Sacramento Delta. Directly south of the Golden Gate is the City and County of San Francisco, which is grey in appearance due to the high concentration of buildings and roads. 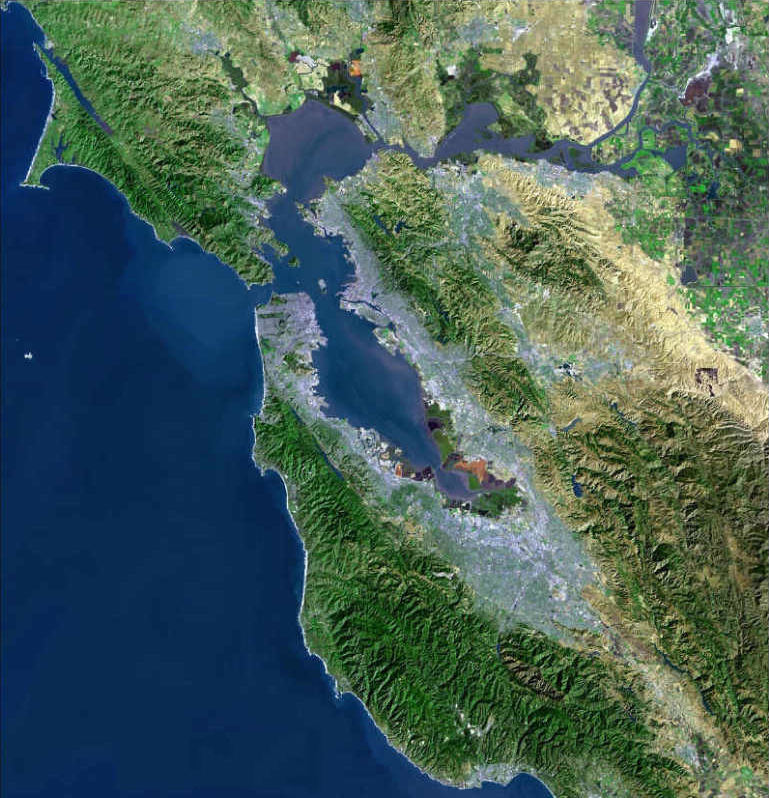 The urban zone continues to Silicon Valley at the southern tip of the bay (bottom) and around to the East Bay. The green plots in the far upper right are the flat agricultural lands of a small part of the California Central Valley.